Koh Samet, located in the Phe District of Rayong, is known as an Island Paradise of Thailand. The island offers a tranquil atmosphere combining with the white sandy beaches and crystalline clear sea-water. Traveling to Koh Samed is easy. It takes about 2 hours and a half to drive from Bangkok (about 175 kilometers) and only 1 hour from the popular beach resort of Pattaya. The travelers have to travel to Ban Phe, a port near Rayong Town, in order to catch the boat or ferry. The boat rides takes about 30 minutes. The most popular pier is locally called "Na Dan" which evolves into a small village - generally known as Koh Samet Village. It is the closest point from Ban Phe, so no doubt it is most popular. Other piers are also available on the island such as that on Vongduern and Ao Prao Beach. At "Na Dan", there are several pick-up trucks, ready to transport visitors to the different beaches on the Island. The cost varies depending upon the beach that you would like to go since the distance counts. Although the vehicles look very basic, the truck operators here are more or less well organized with the pricelist clearly posted at "Na Dan". You may complain to the authority if you were ripped off; but this is unlikely to occur. The closest beach from "Na Dan" is Haat Sai Kaew or Saikaew Beach which is about a kilometer away. 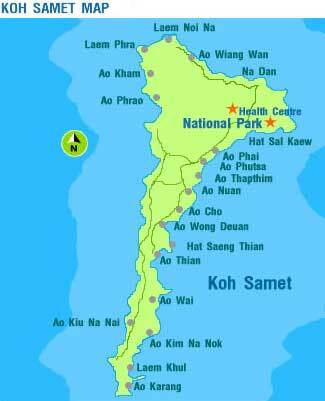 (Meaning: Haat = Beach; Sai = Sand and Kaew = Crystal). As the name suggests, Sai Kaew means crystalline sand as the beach is shiny, glittering with white sand. Moreover, the sea water is very clear and warm. Haat Sai Kaew is the longest beach on the island. Travelers can hop over from one beach to the next either by foot or by the pick-up trucks that run around the island. These beaches are namely:- Sai Kaew Beach, Ao Phai, Ao Vong Duern, Ao Wai, Ao Kui Na Nok, Ao Kui Na Nai, Cape Khut, Ao Toei, and Ao Prao. There is a small unpaved road connecting these beaches in the above order. On the island, there are many small hotels and guesthouses with basic standard. Some guesthouses on less popular beaches provide only the lodging. It is ONLY lodging with a cushion, a pillow, a mosquito net and perhaps a blanket. That's all, nothing else - not even electricity nor water supply. The guests have to purchase their own water charged per tub for toilet or bath. Many hotels do provide electricity, but only partially, not 24 hours as the electricity can be off at midnight. Lantern is perhaps the only choice. For those who prefer comforts, you should check with your hotel ( your can book Koh Samet Hotels online here or your agent if the electricity is supplied 24 hours a day as well as the water supply. This is due to the fact that the resources on Koh Samed is limited. Although it is only 30 minutes away from the mainland, every supply on the island, except fish, has to be imported. Update as of February 2012 most bungalow operations offer en-suite facilities, "warm" and cold running water, 24hr electricity, fans and/or air con rooms, most also provide adequate wifi. You can reach these places via the island's 'road' - a rising, falling, winding, red dirt calamity that songthaews manage to navigate. So obviously it's much more fun to walk along the beach and clamber up and down the rocky shoreline, making periodic swim-and-drink pitstops. The island's fisherman may think you're nuts, but don't let that deter you. The further south you go the more local the guesthouses and resorts become, however, I saw contented-looking farang at most of the places I wandered past. Ao Pai, near the northern end of the island, retains the most spacious ratio of flesh to sand, given the number of places to stay here -good quality guesthouses like Tok's Little Hut and the popular Naga Guesthouse, with prices starting in the Bt300 range. Many restaurants and bars to choose from also (most of which have guesthouse extensions) including Jep's, which serves up cheap food in plentiful amounts. Ao Phai Hut, however, is on the costlier end of the spectrum, with bungalows beginning at Bt500. Ao Pudsa and Ao Tubtim, a couple of beaches south of Ao Phai, are also relatively uncrowded and have a smattering of places to choose from. Friendly looking Tubtim Guesthouse has rooms starting at Bt1500 - Bt3000 that include a bath. Further down is Ao Lung Wang and Ao Cho, and here you're already in more deserted country where your beach buddies are more likely to be Bangkok weekenders rather than drunken Brits. Consider that a ringing endorsement. Wonder Land Bungalow has huts starting at Bt200 and bungalows from Bt400-800. Tarn Jawan, snuggled up beside a fairly empty and appealing stretch of beach, has bungalows starting at Bt800. The next big enclave is Ao Wongduan, a fine place to watch farang fat fry in the sun. This is a major, crowded spot, in which clusters of umbrellas line the long stretch of sand. Wongduan is a more resort-like area, with places like Malibu Garden Resort charging Bt950 for a standard room (though cheaper places can be found) and vacationing Western families frolicking on the beach. Stumble past it, and more idyllic beach experiences await. When you reach the Ao Tien area you're liable to be surrounded by guitar-playing groups of Thais roughing it in tents on the beach. It's tempting as hell to crash out here in a more secluded area with equally pristine beaches. Candle Light Resort has bungalows in the Bt800 range. Ao Lungdam, a little further down, is also more local and smaller, with places to stay from Bt300 and up. If you've gotten this far south on Samet you'll be wondering how to get back to the action on the north end before the sun goes down. Hit the road and a songthaew may eventually roll past; if its full and you can hitch a ride for Bt20 you've done well. A recently constructed reservoir has improved the availability of fresh water on Koh Samet, Thailand, which was an enduring problem on the hot and dry island where the rainy season is limited to the May to July period. On the other side of the island from Hat Saikaew and past the reservoir is Ao Prao beach, this houses the more up market hotels on the island, the shady beach bar at Ao Prao Resort the is a great place to while away a lazy afternoon, worth the extra cost if you want something a bit more up market. Ao Prao also boasts the most expensive hotel on the island Le Vimarn Cottages Hotel, it has a swimming pool, never seen anyone actually use it as the beach and water are great for swimming. Splash out on a massage on a comfortable table under the shady palms on the beach, you know it makes sense.